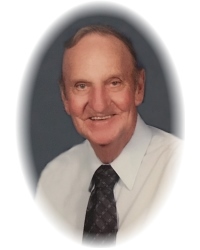 Mr. Fred Arp, age 83 of Jenkinsburg, Georgia, passed away on Sunday, March 31, 2019 at WellStar Spalding Regional Hospital. Mr. Arp was born in Culberson, North Carolina on November 25, 1935. He was a devoted husband to his wife, Tressie, for over 62 years. He was a loving father of four and grandfather of six. He proudly served his country in the U.S. Army Amphibious Transport division as an Amphibious Transport driver in Bordeaux, France from 1955 – 1957. He worked as a Journeyman Tool & Dye Maker for over 38 years and retired from Lucent Technologies in 1999. He turned his live over to the Lord in 1957 and served as a Deacon for over 30 years and a Sunday School Teacher for over 25 years at Mt. Zion Baptist Church in Jonesboro, GA, and continued winning souls for the Lord throughout his life. He was an avid Braves fan. He loved traveling with his family and working in his yard and home. Survivors include his wife of 62 years Tressie Mae Arp; sons, Ricky (Glenda) Arp, Jamie (Tammy) Arp; daughter, Katrina (Darryl) Culwell; grandchildren, Stephanie Arp, Eric Arp, Nola Arp, Chris Culwell, Tristan Arp and Brooke Strickland; brother, Buford Arp; several nieces and nephews. A visitation for Fred Arp will be Thursday, April 4, 2019 from 6:00 pm until 8:00 pm at Conner-Westbury Funeral Home. A funeral service will be Friday, April 5, 2019 at 1:00 pm in the Chapel of Conner-Westbury. Reverend Chris Reynolds will officiate. Interment will follow at Forest Hills Memorial Gardens, 722 Conley Rd. Forest Park, GA 30297.